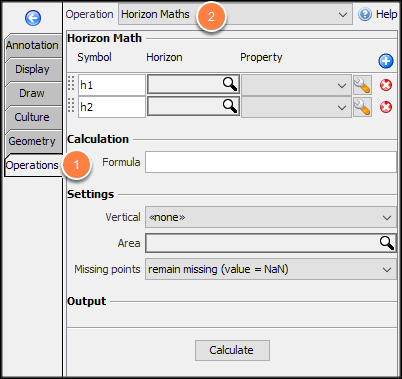 Use Horizon Maths to create a horizon from mathematical and logical operations using one or more horizons as input. Note: The Calculate button is disabled if the selected horizon in map view is waiting for another operation (such as propagation). Insight notifies you to complete the previous operation before continuing. Where is the Horizon Maths operation? Horizon Maths is found in the Map View, under the Operations tab (along with other horizon operations). At Operation, select Horizon Maths. Symbol: text to represent this value in the formula. Property: the property from the horizon (see Horizon Attributes). see Functions and Variables for Math Expressions. see Common Horizon Tasks for Horizon Maths. Vertical: choose the vertical dimension of the output. TWT (ms), TVDSS (m), TVDSS (ft) or none (amplitude). This updates to match the chosen input horizons. NOTE: When calculating depth from time horizons (or vice-versa), update the vertical domain to match the expected output i.e. when calculating depth, choose TVDSS as the vertical dimension. remain missing (value = NaN): points missing from the input horizons are not filled. Missing points are treated as null values. are set to 0: points missing from the input horizons are filled with 0. Missing points will be calculated using 0 values for the inputs. Review Output to confirm that the operation is creating the type of horizon you expect. 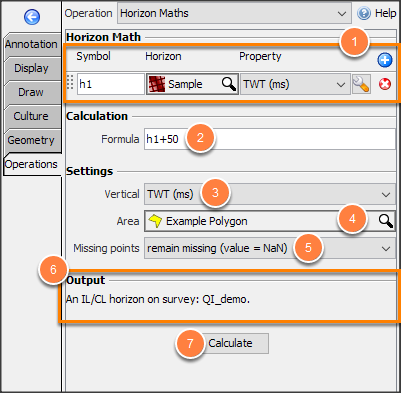 If horizons from different surveys are used, the output horizon will be a multi-survey horizon. Note: By default, the new horizon will be named: “math: formula”. For example, the operation above will yield a new horizon called "Math: h1+50 ". To rename the horizon, see Horizon Details and Configuration.